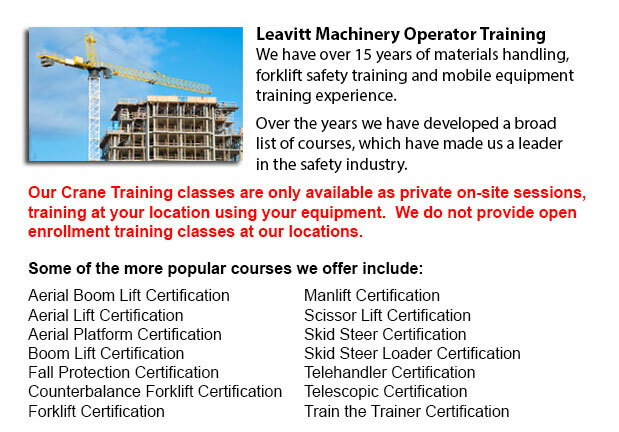 Overhead Crane Operator Training Grande Prairie - Our overhead crane operator training program is meant to teach staff the fundamentals of overhead crane/sling operation and pre-shift checks. Programs are taught by our expert trainers and consultants. Well-trained employees are more efficient and productive, that really saves on costs connected with merchandise damage, property damage, and accidents because of the utilization of incorrect operating measures. Our overhead crane certification is customized for workers who have literacy barriers, reducing certification time by 50 per cent. Overhead cranes are suitable for particular repetitive hoisting activities. This kind of crane has wide ranging capacities. They may be used for specialized hoisting tasks like installing or removing major plant machines. In order to safely utilize an overhead crane, staff have to employ safe rigging practices. This requires both knowledge and practice. The load should be rigged properly in order to guarantee its stability when hoisted. Before beginning a lifting task, it must be determined that the crane is right for the task, with correct travel, lift and capacity. The crane must be subjected to a thorough physical and visual check before use. The capacity of all equipment, including the rope, slings and hardware, must never go beyond load weight capacities. Prior to utilizing the rigger must know which sling is best for each and every lift and be able to inspect the rigging hardware and gear. The communications that are used with the crane operator need to be concise and clear. A signaler needs to be chosen for the role and signals must be agreed upon. The operator of the crane should follow directions from the chosen person only. If a remote or wired controller is being utilized, the operator should be trained in all its functions. Prior to any lifting starts, the path of the load should be cleared of all hazards and a warning sign should be issued to guarantee the safety of the personnel. Pedestrian are not under any circumstance allowed to walk below the lift loads. The crane hoist should be centered over the load before lifting in order to prevent swinging. The safety catch must be closed immediately after sliding the sling fully onto the hoisting hook. Sling legs which are not utilized should be secured so they do not drag. Never leave loose materials on a load being hoisted. Watch that fingers and hands are clear when slack is taken out of a sling. Step clear of the danger zone before the lift is made.